Feel free to discuss below and contribute to improve this guide. Affliction excels at keeping multiple targets under constant pressure. 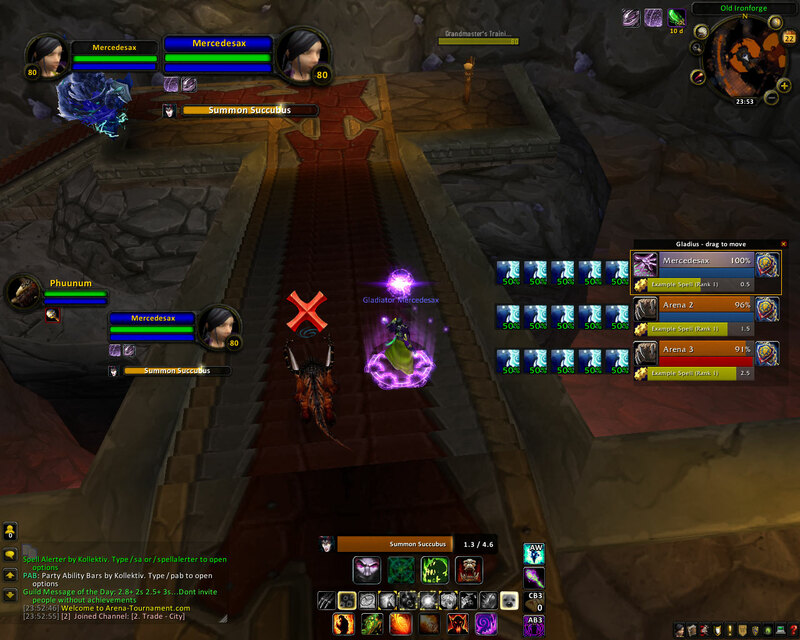 As an Affliction specced Warlock you don't want to tunnel and burst one target from beginning to end. You must make your enemies suffer and crawl in agony. Spread dots on everyone, keep them under pressure and make them panic. Once someone in under 25% the game is in most cases over but do not celebrate too early. If you like having the opportunity to global anyone, doing incredible amounts of constant burst and peeling alot better you should play this spec. Is more viable than Affliction and a less to care one. If you get CSed on Shadow tree you can freely cast your damage abilities but you cannot cast fear. Destro is superior vs Spellcleaves because of Nether Protection yet more easily to counter as a team with a dispeller. 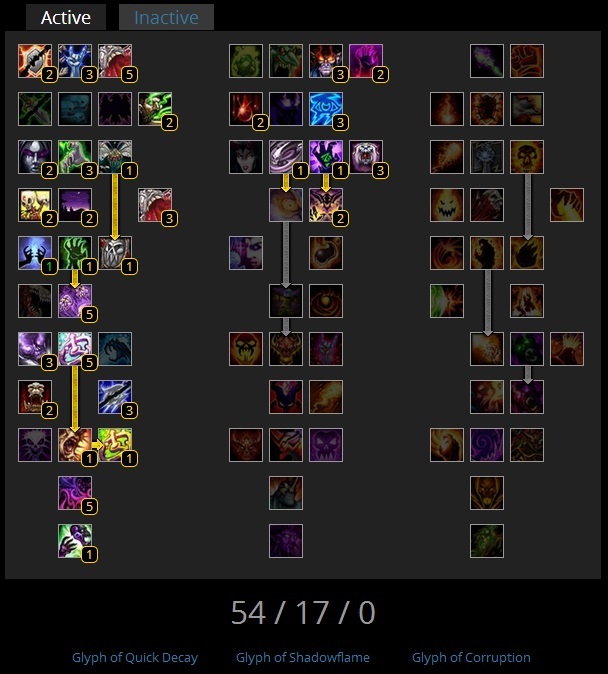 Since we're talking about 3v3, there are only 3 specs viable more or less for Warlocks. 2 of these one are Affliction based and one for Destruction. CoA spec. This spec is good when playing most MCH comps since no one will let you have 100% uptime on targets and you are the only one who is gaining advantages of CoE. OBS: For shadowcleave (affliction/dk/healer) you should pick up Glyph of Howl of Terror. CoE spec. 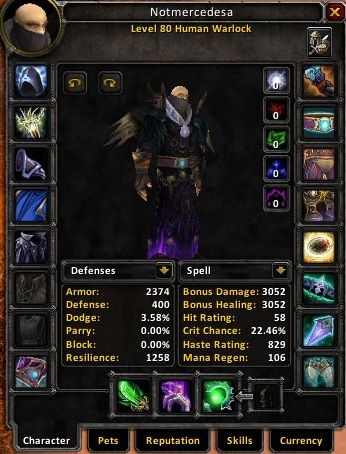 Normal Affliction spec. Superior when playing RLS and Spellcleaves because the pumped damage will be alot more and in a shorter time than MCH. Destruction. Nothing more to say. Standard Destruction spec for 3v3. So you got your talents and your glyphs. Now it's time to get some gear. 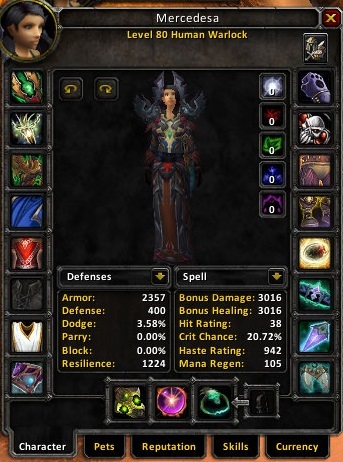 In case you are wondering what stats you want on your gear and spec, look below. You will want to sacrifice a little bit of resilience and Spell Power for haste since you will have better peels in comps you will play with this spec (talked above about this). Destruction is a lot stronger spec for surviving spellcleaves and has more peels vs meelecleaves so you can drop resilience and get more haste. Red: Runed Cardinal Ruby (23 SP) or Reckless Ametrine (12 SP + 10 Haste). Blue: Shattered Eye of Zul (10 haste + 12 SPen) or 12 SP + 12 SPen. Here depends of your playstyle. I recommend Eye of Zul gems. Yellow: Quick King's Amber (20 haste) and Mystic King's Amber. Since you'll want only the bonuses of your Head and Legs for your red gems you can put only yellow gems on chest. Legs!! : 50 SP + 20 Spirit. No! 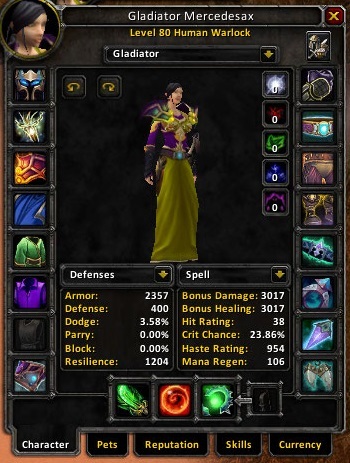 Warlocks don't need Stamina and Fel Armor converts spirit into SP so this is superior to the overused enchant 50 SP + 20 stamina. Warlocks are the brain of every team they're in. They can do the most damage and good CC chain. With a good lock in the team you can be able to reach high ratings. FEAR. FEAR. FEAR. This should be your in-game love as Warlock. The secret in winning is not pressure, is how long you can lock other team, preventing them to peel or heal. Fear can be used as a peeling spell, an interrupting spell and a KILL TIME spell. You'll never get kills without a CC only if the other team is bad. Focus on getting CCs in order to score the kill. You are tunneled by a warrior and he has the interrupt ready. He goes into Berserker stance so he can interrupt you without 1h+shield. What's a lock to do? There are 2 options: fake cast in 0.1 time like start to cast a spell and then IMMEDIATELY cancel it. He probably stays focused on pummel bind awaiting you to cast; 'cast a non-important-tree' spell (EG: you're destro and managed to get a fear on healer while going for 3rd one and warrior is on you. Cast a Shadow Bolt. It will hit for same damage as an Incinerate if it lands or if he interrupts it you can do your rotation with fire spells). Never get pinned on your portal. Is the worst place you can be forced to fight as a warlock. Usage of portal is different and depends on situation. Use it when warrios are out of charge/intercept or rogues are out of Shadowstep to be able to get pressure/be topped up. VS Warriors beware! Never use portal when Bladestorm is up and you're getting pretty low or they already got a good kill set-up on you. Portal can be used to avoid CC too. My favourite thing is to port AoE fears (Howl, Scream). However, porting a Mage Polymorph while you're novad for 7 seconds and the fight is at the other pillar of your port is a major waste of teleporting. Why? You'll be novad in your portal for 7 seconds, incapable to do anything and he can Polymorph you for full when you get out. The ability that give Warlocks OPness. Use it careful when your team is dropping, use it offensively when you're in killing phase and pray to God when you're using it to dispel major CDs. Offensive Devour Magic: you're casting Haunt on a warrior in middle and he has 1h+shield. Is it obviously that he's going to reflect, no? Before Haunt ends on about -0.1 do a Devour on warrior so your spell won't back fire to you. Same goes for grounding. IT'S FORBIDDEN to use it in this way when they're in pressure and they will probably get CCs on someone in your team. Don't be stupid, don't be rushy. The gates are open! First thing you do is putting portal at a pillar and getting away of it. Now you must decide whether you use Fel armor or Demon armor. Use Demon armor vs meelecleaves or MCH with a MSer (eg. 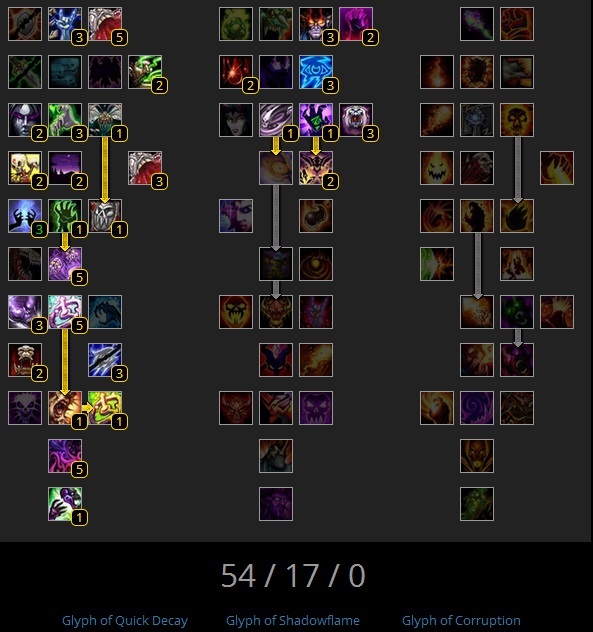 WLP,WLD,HLP,HLD) and Fel armor vs spellcleaves and non-MS MCH comps. Now this is the moment where the game is decided 50% (believe it or not). Either you wait for them to rush you or you'll rush them. Is like in RL, who do the first punch will mostly with the fight. I like to stay back with my healer (around the middle) while the other dps goes in and is setting up targets for me. EG: with a shaman I let him to purge targets first; with a warrior I wait to get slows and Rend on them; with a DK I wait for slows and diseases on everyone. Don't bring the fight in your starting area or around the portal. Always push in. The only moment you should "retreat" is when you want to bait one opposite member to outrange their healer. Keep in mind that setting up and starting the game strategy is not the same with the defensive play. a) 2 of your team members are CCed (this includes you too). Devour Magic didn't get the supposed CC? Spell lock on CD? Which one of you is free? What can he do to prevent damage or the incoming CC? Talk with your mates about these things and decide who should use the trinket or defensive cooldowns. b) Your pet is dead. No Fel Dom. What to do? Can they peel your resummon? How long for Fel Dom? The answers provided help you deciding whether playing def or setting up. c) They dropped one of you under 40%. No matter what your pressure is, take time to peel properly. Analyze the situation and take the best decision. EG: 2 of their DPSes go for your healer. You and your teammate go for their healer and you have your Spell Lock ready. Now, assuming both healers have the same def CDs what will you gonna do? Will you decide to CS one of the DPSes to peel or the healer in order to try getting a kill? CS the DPS! There are plenty of opportunities so your team shouldn't risk anything. You will get the momento again later. Analyze your CDs, fear DRs on opponents and HP of your team. When you're forced to go defensive do anything to stabilize the team and counter-attack them. Spam Curse of Tongues on casters, Curse of Weakness on meeles. Spam fear on everyone untill is full DRed. Shadowflame, Shadowfury are not allowed to be available in desperate mmoments. Death Coil can be used too to gain few seconds. IT DOESEN'T MATTER what you do if you feel there is a SMALL possibility to lose the game as long as you can keep everyone safe. The difference between good locks and average locks is knowing when to go DEF STYLE and when to go KILL MODE. Unstable Affliction is the most powerfull spell of the spec. You have to have it on the target you focus aswell on other targets. It offers dispel protection of your magic debuffs and deals a good amount of damage. If you ever cast a fear on a DPS from other team make sure you put UA as a protection. You create a moment of hesitation amongs the dispellers in that team. The moment "Should I dispel it or not?" comes and you can get important seconds in setting up the kill. Immediately after the fear you should focus now getting dots on dispeller. Why? Imagine full dots + a UA dispel. That's ~10k damage in a global and makes the switch on him inevitable. If you cannot get any dots (grounding, CSes, CCs, LoS) don't be shy to just spam Curses and Corruption on everyone. There will come the moment to cast something do, don't be rushy. Haunt is the only spell providing a considerable direct damage and self healing also. Haunt + Demon armor + Healthstone and Drain Life filler should get you from 50%->100%. Keep in mind. Is a spell that should have priority when you're dropping. Is very important to never cast Haunt in Warrior's Reflect or Shaman's Grounding. Is an avoidable and important waste. Corruption. Corrupt all targets in arena! Pets, opponents, gargoyle, mirror imagines, elementals. Corruption must be up 24/7 on all. It gives Shadow Trance procs a.k.a. no-casting-time Shadowbolts. Searing Pain or Drain life? Drain Life is the main filler. When full dots are up and the setting phase is over, use it. Searing pain does more damage and is a fire treed spell so if you get CSed on it, you can still get pressure by shadow tree. Drain Life is channeled so it can go through LoS and it can give Shadow Trance procs. Searing Pain should be used only to bait interrupts. EG: One opposite member is low and one of the others have CS ready. You can risk to fake their CS or cast Searing Pain. Think about it. The possibility that they will instant interrupt you is very high as they are expecting you to cast something to harm their low member. So cast Searing Pain and /lol at them. Drain Life for Corruption. This is a must-do move that I know many warlocks missed it. Corruption's full duration (18 sec) can be reached in 3 ways: by casting Haunt, Shadow Bolt AND Drain Life on someone already corrupted. Yes, Drain Life makes 14 sec Corruption up to a 18 sec one. Is a good new way to start the dot rotation with 18 sec Corruption. More damage with only 0.1 channeled cast of Drain Life. Immolate is the main spell of this tree. In order to do your damage rotation you have to keep this spell up. You can cast Conflagrate only with Immolate and Shadowflame up yet I don't recommend casting it with Shadowflame only for desperate kiting measures and Incinerate and Chaos Bolt do 10% more damage with Immolate up. Now let's talk about Chaos Bolt. The most powerful 3.3.5a warlock spell. It can pierce through all absortion effects and shields and does a high amount of damage. CB must be on cooldown 24/7 but as well as Haunt, don't get reflected on it or grounded. Is a shame for a lock to get -4k HP while warrior uses only 10 rage to reflect that. Is pretty hard to handle as Destro vs dispeller teams. You can get good momentos with Shadowfury stun but you must bait them to be alltogether in order to get Immolate up and do the rest of rotation. 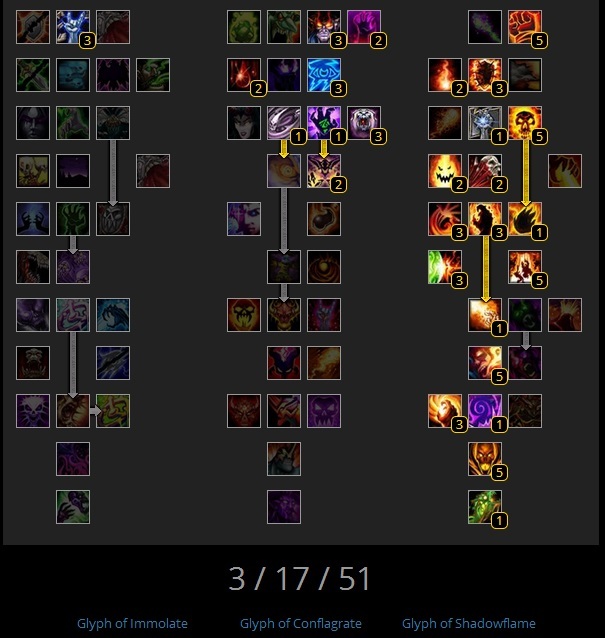 Won't talk about Destro because I find it only viable with a Mage (MLS/MLP) since people learnt how to counter it in 3v3. Felhunter. Offensive and devensive dispel, Spell Lock. Fel intelligence. Enough. Main pet in both specs. Succubus. This pet can be good only in FEW situations to be at least as good as a Felhunter. You have to be Seduction specced and geared (0/3 Suppression and 3/3 Improved Succubus + additional hit gear to be hit-capped) because 1.5 cast is useless. Succubus works as a desperate measure to CC or to bait interrupts/charges. When you get pinned on a place and the healer is LoSing your fear you can do nothing but wait for Shadowfury. So here's when Succubus is a bit better with the 0.5 Seduction cast. However, the pet is fragile in 3v3 and meant to be tunneled by all teams. A good situation when Succubus can be used is MLS vs ATC match-up. Your Mage should get all traps of shaman then or it's a lose after the 2nd full trap on shaman. You should always take advantages of Howl of Terror being a different type of fear than Fear. That so, you can Fear on target and Howl the other/others so you can get a 3vs1 situation. You cannot kill them or stop the kill on one of your mates with only one CS. Fel Dom another Felhunter so the Spell Lock CD will be resetted and you can CS the same player again or another one to end their pressure. You didn't dispel a CC on your partener and you MUST do it in order to survive. You need that but you missed in first place. Fel Dom the Felhunter and try again. You're low and you need few more seconds to get healed up to a decent HP. You know you can win the game after this critical momento. Fel Dom a Voidwalked and use it's Sacrifice shield to spare some seconds. If you're using it vs Mages be sure you have Detect Invisibility on you so they have a chance to not steal the shield. Spam the trash debuff until they get it. You chased the player to fear him and you cannot get it. You're frustrated. If you have your Spell Lock ready put pet to attack that target. If you just shadowflame him to slow he will probably already spamming dispel on self. He's not dumb. Be smarter. Shadowflame + Spell Lock him in order to 70% slow him for 3 seconds while you have time to Fear him and also re-Fear his trinket if he uses it. Howl of Terror and how many spectators you have. MUST BE VIP! As a last word. I feel that the huge step that helped me in arenas is the fact that I started using Focus and Target Arena1,2,3 macros. It helps alot with controling everyone in arena and that's what a Warlock's to do. Control and outlast opposite team's CDs. Is all about the quality of the gameplay. The guide was made 100% by me. I've a twitch channel where I stream mainly Warlock playstyle. Last edited by Mercedesa on 17 Nov 2013, 22:52, edited 7 times in total. You do know that Chaos Bolt also deals 10% more damage to targets affected by Immolate right? Also, why never use the Succubus, especially when with a mage and against melee cleaves without magic debuffs? It's an incredibly powerful pet on Cata where it is significantly weaker, so I don't see any reason to always shun it on 80 where it has a 0.5 sec Seduction. Is the loss of 2 potential talent points (for imp. Health funnel I'm guessing?) that much of a big deal? Aaaaand I think you're wrong with the Chaos Bolt + Immolate thing. Mercedesa wrote: Aaaaand I think you're wrong with the Chaos Bolt + Immolate thing. That's what the tooltip (Fire and Brimstone, right before CB) says atleast. You're a terrible warlock with no deep knowledge about the class who bought glad boost. Neretzek - 5 year veteran. Correct me if im wrong, but didnt Jpeg win a game against Marm in the finals, using Sucubus? I think that tells me "Sucubus - never" is wrong. nino wrote: Correct me if im wrong, but didnt Jpeg win a game against Marm in the finals, using Sucubus? I think that tells me "Sucubus - never" is wrong. Demon armor. Warlock should get full dots on first target approaching in the intercept stun. Go in middle and aim fears on paladin. Keep Corruption and CoA on everyone and kite them. Besides WLP mirrors, if a warrior tunnels your lock you should stay on the warrior all game long. Vs MLP avoid CC as musch as possible. In Ruins all 3 of them are a possible kill target but focus on warlock mainly, he must keep CS for Polymorph at the beggining and avoid triple CCs like Howl, P Scream or Shadowfury. After you set-up a bit on warlock, your warlock should chase priest to fear him. In Blade's the Lock and Paladin stay in middle while you push in at thier pillar, setting-up. Go for whoever comes near paladin to get a CC on him. In Nagrand just tunnel lock all day long. You don't need fears on priest since you will win by outpressure. I cannot tell when or not to use Succubus, I just don't like it and I think is an useless pet in 3s. If Jpeg used in a game vs RMP and won that doesen't mean that all games vs RMP would be easier. Mercedesa wrote: I got my Gladiator title for being rank4 at 2704 in 3v3 and I was rank6 LSP too at 2636 last season ended on 18th of August 2013. That description makes it look like you played a different comp than LSP to 2704. Should be edited for clarity. Fair enough I guess, the Felhunter is better overall however I don't think that this should outline the succubus completely since it can prove to be great vs certain comps, as others have shown by mentioning the last tourney in which a game was won by using the succubus. So I think that you should at least partially change your statement regarding its usability. "Increases the damage done by your Incinerate and Chaos Bolt spells to targets afflicted by your Immolate by 10%, and the critical strike chance of your Conflagrate spell is increased by 25%." You should update your guide if you didn't know that. the only game they won, was with succubus. Can correct me if i'm wrong but succubus here actually starts casting in invis, as opposed to retail where it comes out and casts after, hence the "insta seduce" basically. That's why you use it, cause you're bad and can't properly control fel hunter/manage fears. Succu just provides the easy CC anywhere, basically any time, but your guide is more 3's focused/point of view, where people actually know how to deal with the succu, and it fucks up fear DR.
Ofc if you're Jpeg you can make it work at the highest levels of play but imo using Succu in 3's just makes people hate you, and you are almost always made the Kill Target cause of it (from my experience as RMP). Good guide, really learnt something from reading it, but still as a general 3.3.5 guide I think you should include a point about the succubus, since so many use it in 2's and such. Also iirc you said in the guide that conflag can only be used when immolate is on the target, which is not correct. Shadowflame proc also enables conflag. Changed the title&description yet Taximan let's not make from this a big point. This guide was meant to be only for 3v3. I will do maybe a 2v2 guide too when I will be bored again.